ClientLook makes it so easy to log the outcome of meetings, calls, property tours and more. Relate updates to one or more contacts, deals, properties and comps. Choose how you want to share any update too. Organize emails in a whole new way. 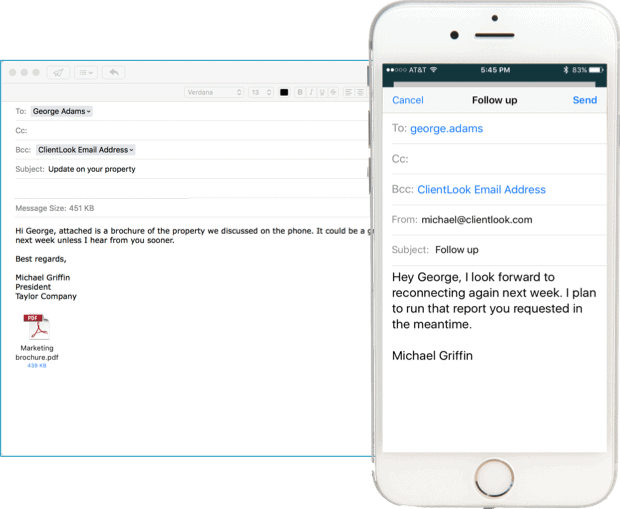 Connect emails sent from any software and device to your contacts. Works with multiple recipients and attachments without any special widgets, utilities or downloads. Nothing falls through the cracks when you schedule activities related to contacts, deals, properties and comps. Even designate sharing to determine who sees each item. The Activities module keeps you on top of everything from important calls and meetings to long-term lease expirations and option renewals. Even view shared calendars. Sync and export activities. Scoop is a real-time activity feed that keeps you on top of everything in one convenient place. It displays every update, completed activity, comment and email company-wide. Search anything. Add comments. It’s the ultimate internal communication tool.